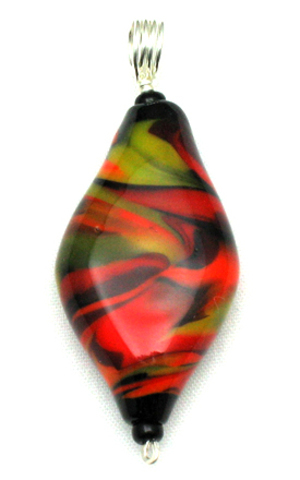 This flat, diamond shaped pendant bead is another in my “marble” series. Though the colors are unlike any marble I’ve ever seen, it is the patterning of marble that I want to emulate in glass. The base color of this bead is black. Red, orange, yellow, and clear glasses were added to partially cover the black. The molten glass was then manipulated with a pick and shaping paddle to produce the beautiful patterning. .